It's the first day of December and I literally can't believe it. I feel like I have completely lost track of time if that makes sense lol. Okay so technically I was supposed to have this up on Friday but I had no energy to blog so it didn't go up lol. 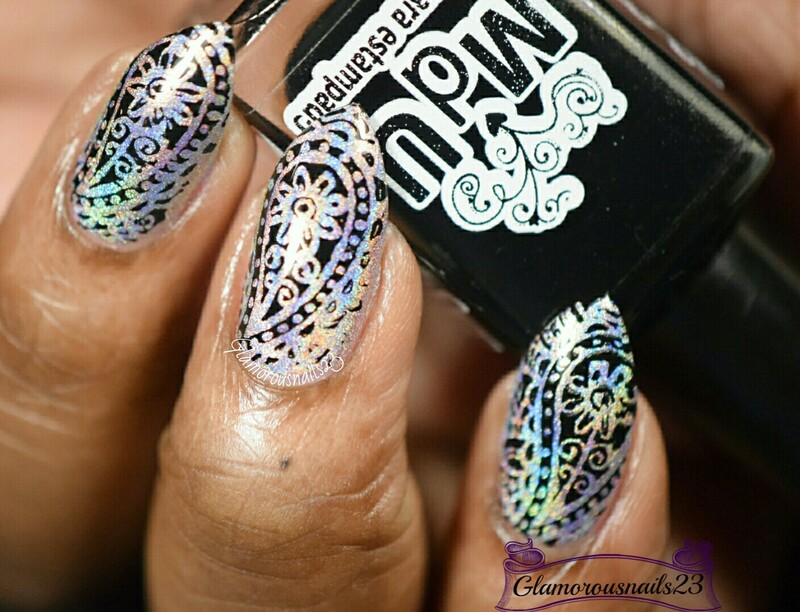 This is the last mani for the WNAC November 2015. The theme for the month was Elegant and the prompt for the last week of November was Paisley! Let's see how I did. As I have said time and time again I can not draw. Not to save my life. I literally mean if my life was on the line and I was told to draw I'd die. Lol. It's just something I have to practise more with but don't know if I'll actually get better. So instead of attempting to freehand the paisley design I went with stamping! 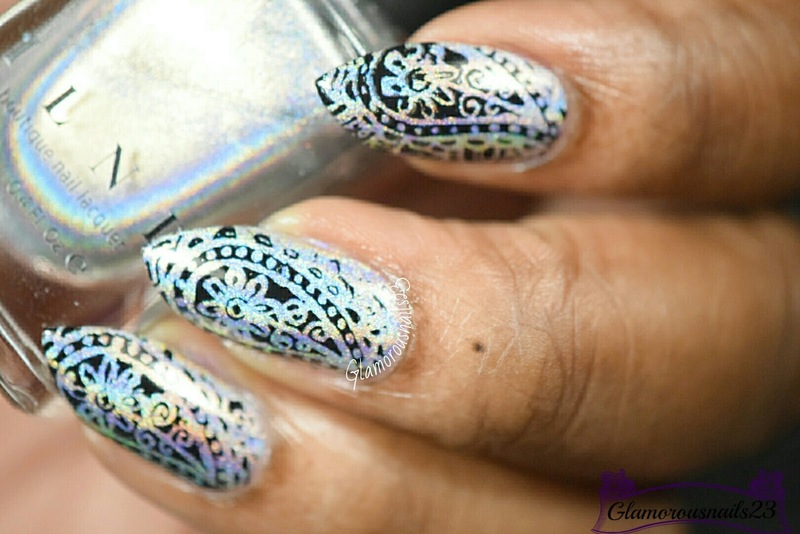 I love that you can still see the base color even with the stamping. I really like how this turned out too. 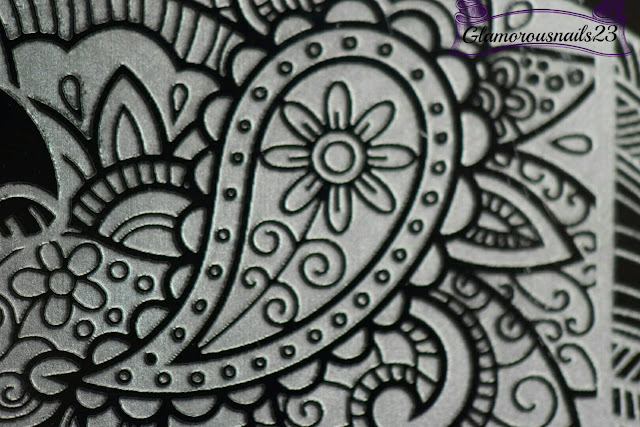 Here's the image that I used for this design. That's it for today! 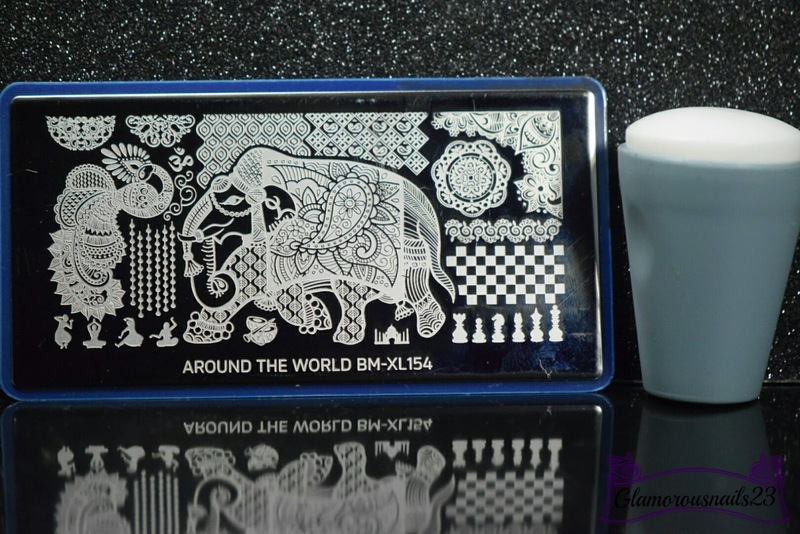 Did you take part in last months WNAC2015? Will you be participating in the one for this month? Do you like doing these types of challenges? Let me know in the comments below!! I adore the silver with the black! It's such a great classic combo! I swear the days are just flying by girlie! 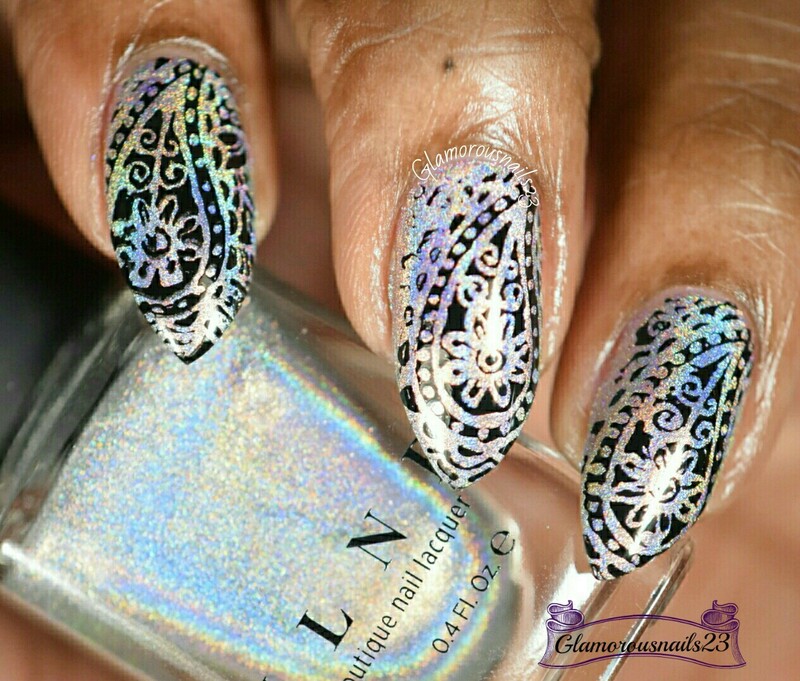 This mani is fabulous! Muito legais, só não curto esse formato. 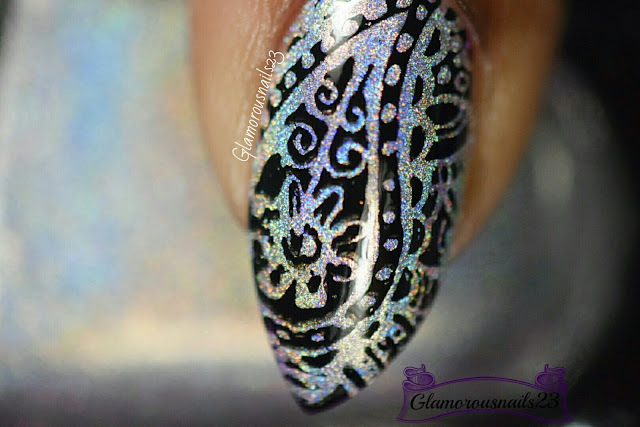 Wow, that stamp just pops against the holo, beautiful! Glad to know I'm the only that feels that way! Thank you!! Thanks Amy! I'm glad that you like it!! Beautiful! I hope to participate this month! Thank you! I hope you get to participate as well! This is a great mani! I love your photos of it, too! You made me want to run and stamp. Stunning! 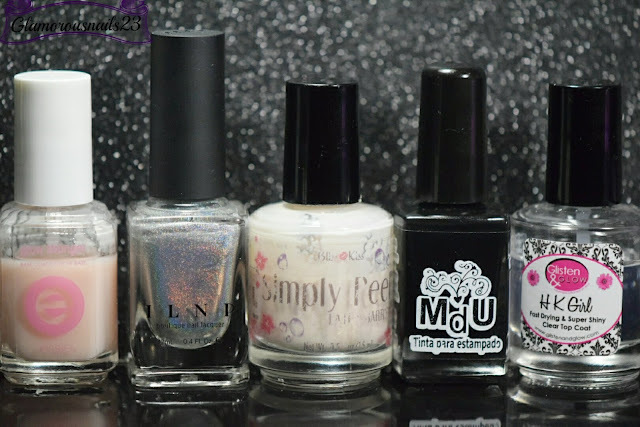 And I love that ILNP! Thanks! It really is something!